Breslin Builders has been providing design and construction services for Rebel Oil Company for many years. 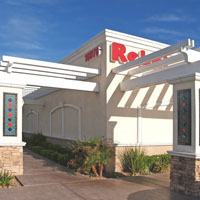 With stores ranging from a few thousand square feet to stores in the 5,000 square foot range, Breslin Builders has provided the required services to allow Rebel Oil Company to keep pace with the growth of the Las Vegas valley. Breslin Builders provided the recent design updates for the next round of stores to be built and will be the “gem” on the corner with such materials as decorative stone veneering, decorative ceramic tile, expansive glazing, as well as the signature lush landscaping that each Rebel Convenience Store is known for. 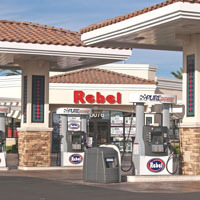 If you see a Rebel Convenience Store in the Las Vegas valley, as well as Boulder City, Pahrump, Searchlight, or Beatty, chances are it was designed and built by Breslin Builders. Providing a much needed update to an existing corner, Breslin Builders provided design and construction services for a new Chevron Convenience Store with gasoline dispensers. Working with the neighbors and part of a redevelopment area on the west side of Las Vegas, enhanced exterior and interior finishes were incorporated in the finished project with such materials as stone veneering, enhanced lighting, stamped and stained concrete, as well as upgraded landscaping. At approximately 4,400 square feet of store, along with a decorative gasoline canopy designed to complement the building, this project is now the shining jewel of this intersection. This 4,576 square foot project includes a convenience store with a self-serve car wash and a gasoline canopy and is adjacent to the Centennial Retail Center also designed and constructed by Breslin Builders. 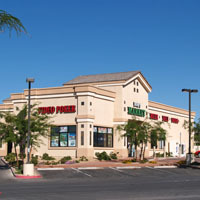 This project was designed with the building on the corner to accommodate the requirement of the City of North Las Vegas Planning Codes with the canopy to the interior of the project as well as compliment the existing retail center to the east. 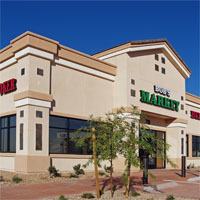 Replacing an existing small out dated and out of code store, this project was completed in record time due to its proximity to I-15 and to minimize the time the facility was closed. Based on a standard Chevron design, Breslin Builders provided full design and construction services, including demolition of the existing building and canopy. 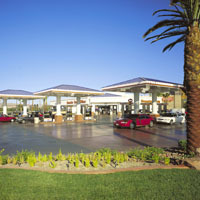 A unique project including a convenience store, full service car wash, and gasoline sales, this project was squeezed into the corner of Eastern Avenue and Serene Avenue in Las Vegas, Nevada. Designed and constructed by Breslin Builders, the store consists of approximately 3,867 square feet and includes a full service car wash tunnel on the north side of the project.